Not a great photo - I took it with my cell phone while balancing the plate on top a pillow on top my lap! Sorry! 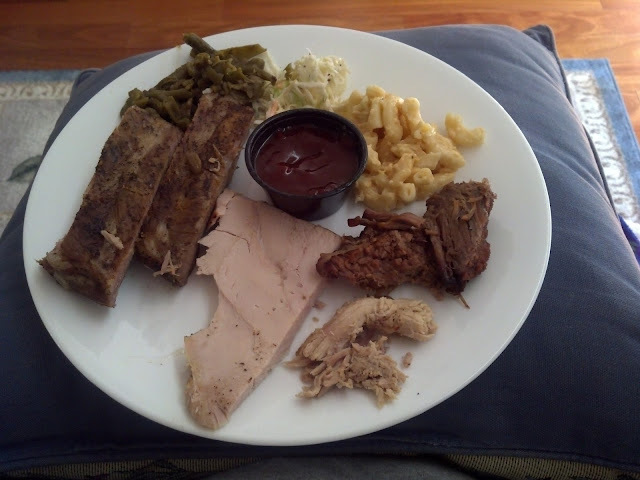 That is a plate of take out food that we got from Selma's Texas Barbeque last Friday afternoon. We ordered enough that we all got to sample a little bit of everything except for the sausage, which was on the smoker and not due to be ready until 7 pm that evening. Selma's is on University Blvd in Moon, so it's not too far from our house, maybe 10 minutes. In the photo, going clockwise starting from 12 o'clock, I tried cole slaw, macaroni & cheese, beef brisket, pulled pork, smoked turkey, ribs, and green beans with bacon. Kansas City sauce is in the center. The cole slaw is good, nothing special but definitely not bad cole slaw. The macaroni and cheese is yummy. Not too cheesy, not rubbery, just delicious, long and slow baked macaroni and cheese. The beef brisket might have been my favorite of the meats. Tender and smoky. The pulled pork was my least favorite of the meats - it seemed a bit dry to me. The turkey was much more delicious than I expected. Then again, I never have high hopes for turkey. It was moist and flavorful. The ribs were very good, too. Lots of meat that easily pulled from the bone. The green beans with bacon were way too peppery for me - I had one taste and gave the rest to SP! I really liked the Kansas City sauce - thick and rich, as advertised. We also got a chicken dinner but didn't try the chicken until a few days later on leftover night. It was moist and tasty as well but not super smoke flavored. Mom and SP liked the corn muffins. We ordered a Full Slab of Ribs, the Trail Boss Sampler meal, and the Chicken Leg/Thigh dinner, each came with 2 sides and a corn muffin, and we got 3 meals from all the food. Definitely a good deal! All 3 of us liked our food and would definitely get food from Selma's in the future.